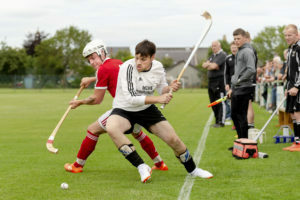 Kyles Athletic and Kinlochshiel will meet in the 2018 Artemis Macaulay Cup Final, Newtonmore go two points clear at the top of the Marine Harvest Premiership and Kilmallie stay top of the Marine Harvest National Division following the shinty action last Saturday. Oban Camanachd were without Scott MacMillan and Daniel MacVicar. Indeed Scott MacMillan will now miss the forthcoming league matches against Kingussie and Kinlochshiel as his booking against Lovat the previous weekend took him through the disciplinary points threshold. Craig MacDougall returned and he started in attack. It looked as if the first half would end goalless when, on 43 minutes, Sandy MacKenzie crashed a 35-yard shot from out on the right into the net. Oban Camanachd keeper Cameron Sutherland got a stick to the ball but the force of the shot took it high into the net. Scott MacDonald started at full centre for Kyles where he did well. However, he was forced off through injury midway through the second half with Dunky Kerr slotting in in his place. The red and blacks were struggling to keep the ball up front although Lorne Dickie had a couple of good chances late on but couldn’t find the target whilst an Aidan MacIntyre shot, after a decent move, was saved with his body by John Whyte. George Thomson was one of the Kyles players given a start with the number of absences and the 19-year -old made the most of his opportunity and was named sponsor’s man of the match. 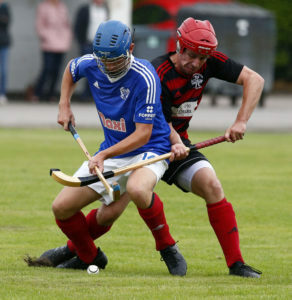 This was a missed opportunity for Oban Camanachd and after the match, their manager Ian Hay was clearly frustrated with what he had just seen. He said: ‘I’m disappointed and frustrated with our attitude today and we can’t just expect to turn up and win matches without working for it. Touchline action: Oliver Macrae (Kinlochshiel) and Greg Matheson (Lovat). Kinlochshiel v Lovat in the Artemis MacAulay Cup semi final (north), played at Braeview, Beauly. Keith MacRae’s knee problem kept him out for ’Shiel whilst Finlay MacRae played at full centre with Duncan Matheson starting at right wing forward. ’Shiel won the toss and opted to play with a slight wind advantage behind them. A rehearsed Kinlochshiel set-piece then saw Finlay MacRae gather the ball but Stuart MacDonald saved with his body. Paul MacRae was booked for a foul on Greg Matheson after Martin Mainland had found Marc MacLachlan with a good ball forward and MacLachlan played in Matheson. Just three minutes after the restart, Lovat were awarded a free hit 25 yards out. Lorne MacKay slipped the ball to Marc MacLachlan who picked out an unmarked Greg Matheson but the ball wouldn’t sit for him and when he did power the ball goalwards, it came off the keeper’s arm and hit the post before being cleared. The game ebbed and flowed over the closing stages but Kinlochshiel, who brought Scott MacLean on for Duncan Matheson with four minutes remaining, saw out the match and they were happy to settle for a single goal win and as they tried to hold ball in the corners. Daniel Grieve and Craig Mainland were best for Lovat when under pressure. John Angus Gillies was the match referee. 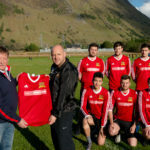 Kinlochshiel and Kyles Athletic will now meet in the televised Artemis Macaulay Cup Final at Mossfield on Saturday August 18 with the sides also scheduled to meet this coming Saturday in a Marine Harvest Premiership clash at Kirkton. Jordan Murchison remained on the Skye injury list along with Ally MacDonald, Iain Murray and Steven Morrison whilst Iain Nicolson was unavailable. Stewart Grant, Allan MacLeod and Ally ‘Spod’ MacLeod were missing from the squad which drew with Lochaber a week earlier. ’More’s Steven MacDonald started a two-match suspension following his booking against Lochaber a fortnight earlier. 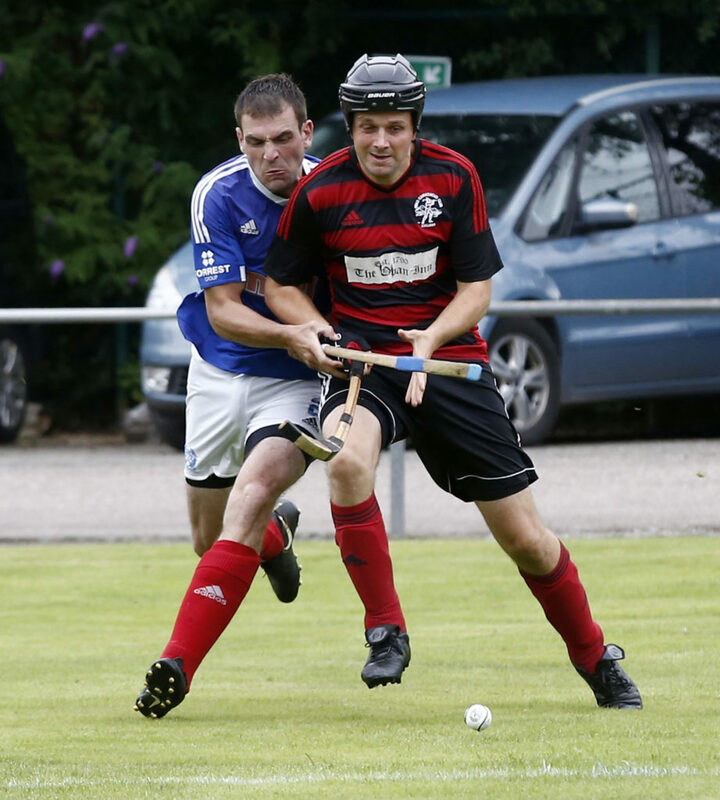 He will also miss this Saturday’s Tulloch Homes Camanachd Cup semi-final against Kilmallie. Iain Robinson returned to take up a place on the bench but David MacLean was still out injured. Newtonmore made an electric start to the game and Glen MacKintosh came deep to fire them into a nine-minute lead. Newtonmore continued to work the Skye defence with some lovely one-touch shinty coupled with some great movement and Michael Russell got his second and ’More’s third on 33 minutes when he blasted a Glen MacKintosh pass past by an unsighted Iain MacLeod, sending the ball just inside the post. There was just enough time to restart the game before referee Archie Ritchie blew for the break. Some of Newtonmore’s first half play was devastating with their players feeling it was their best 45 minutes of the season so far. Will Cowie was the pick of the Skye players whilst ’More’s Drew MacDonald caused Skye problems down the left flank all afternoon. This was a 10th successive win for Newtonmore who are finding form at just the right time of the season. Rory MacGregor levelled on 33 minutes. The ball was played down the line to Roddy Young who sent it on to James Hutchison and he squared to Ruaridh Anderson who slipped the ball to MacGregor to score. James Hutchison then played in Roddy Young to put the Kings ahead on 49 minutes before Alexander Michie ran down the wing and played the ball to James Hutchison and his return pass deflected nicely for Michie to crack the ball home from near the penalty spot. Then, with just four minutes remaining, Colin MacLennan made it 3-3, netting following a goalmouth scramble, with his effort bouncing into the net. There was a minute’s silence ahead of throw up as a mark of respect following the passing of Lochaber stalwart Andrew Dignan. 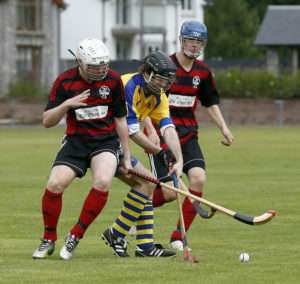 Kilmallie’s Steven Stewart in action during the National League game against Inveraray which the Lochaber side won 2-0. After a scoreless first half, Calum MacDougall gave Kilmallie a 50-minute lead when he lofted the ball into the net from a tight angle. Calum Mclay on 20 minutes, Garry Luke a minute later and Jamie McFadyen on 23 minutes later got GMA off to a great start. Mclay again on 26 minutes and Jamie McFadyen on 28 minutes netted before Calum Mclay completed his hat-trick on 34 minutes. Lewis Morrison gave the Fort a 24-minute advantage and Victor Smith made it 2-0 a minute before half-time. Newtonmore now lead Glengarry by six points with Glengarry just having three more matches to play. ’More can clinch the title at home to Skye this Saturday. Kenny MacLeod gave Skye a 10-minute lead but Neale Reid equalised on 33 minutes. However, Ruaraidh MacDonald equalised for the students just a minute into the second half. 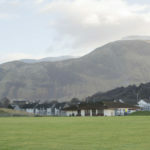 The match between Lochside Rovers and Tayforth was a noon throw-up at Mossfield so the players could watch the Artemis Macaulay Cup semi-final between Oban Camanachd and Kyles Athletic later in the afternoon. Lewis Buchanan gave Lochside a 17-minute lead only for Ewan Menzies to level on 22 minutes. 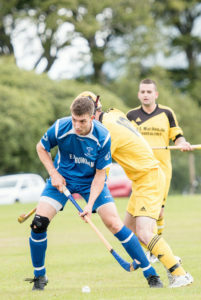 Lochside were playing some nice one-touch shinty which was a joy to watch and Connor Howe, on his return from Oban Celtic, put them back in front after 24 minutes. A fine Scott MacVicar finish just five minutes before the break put Col Glen ahead. And the visitors added a second five minutes from time with another good goal; this time from Conor Kennedy. Dan MacLean gave Balla’ a 25-minute lead but Alex Cunningham levelled on the stroke of half-time. Ballachulish regained the lead through Scott Henderson on 65 minutes but, when referee Graham Fisher awarded Kilmory a penalty with just three minutes remaining, Alistair MacArthur stepped up to ensure a share of the points. However, the match was postponed as it coincided with the funeral of six-year-old Alesha MacPhail which took place in Coatbridge. However, hat-tricks from Craig MacIsaac and Andrew Gibb goal and a Stewart Ross effort gave Kilmallie victory. 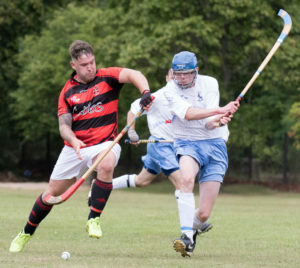 Aberdour travelled with just 12 players including possibly a first for shinty with husband and wife pairing Roddy MacColl and Lisa MacColl taking their places in the side. There was also a place for 12-year-old Owen Burns, who scored his first goal for the club. Veteran Roddy MacColl got the other. However, Ross MacDonald, an Iain MacLennan brace and Sam Bulloch gave Strachur victory. Uist’s Michael MacLeod was named man-of-the-match by veteran referee Henry MacInnes. The Skye Camanachd Ladies’ first team beat Ardnamurchan 18-0 in their noon throw up at Pairc nan Laoch, Portree. However, five-goals from both Laura Gallacher and Fiona Urquhart and a Holli Sneddon effort meant Lovat took the spoils. The Ardnamurchan seconds were awarded the points when the Glasgow and Mid Argyll seconds were unable to raise a team for their journey north. The meeting between Dunadd and Oban has been rescheduled for Sunday August 26. The Women’s Camanachd Association held another successful Shinty Development Camp as 47 young players from throughout Scotland gathered at Strathallan, Perthshire for a weekend’s coaching. Volunteer coaches Stuart Reid, Niamh Donnelly, Lee Thomson, Kirsty Deans and Donna MacKenzie were joined by Camanachd Association coaches Euan McMurdo, Ronald Ross, Paul MacArthur and Katie Drain to put the girls through their paces. The weekend began with some team building activities followed on the second day by drills focused around hitting, blocking and control as well as a World Cup-themed sixes competition. The coaches facilitated a talk around tactics whilst the final day included some more drills specific to ‘game-like’ situations, striking the ball and moving into space.